To promote the new movie "Deadpool 2," coming to theaters May 18, 7-Eleven has launched its first augmented reality in-store experience. The AR experience has three basic components. Tapping the camera icon on the 7-Eleven mobile app makes Deadpool appear to guide fans. Taking a selfie causes the mad scribbler to take over with a red marker. Scannable codes throughout the store unlock various activities, some of which can be accessed after leaving the store. "Fans can interact with Deadpool and have fun experiences in the 7-Eleven app, unlocking different experiences each week exclusively in the stores nationwide and in Canada,” stated Gurmeet Singh, chief digital and chief information officer. “The fans will also be able to share their interactions with Deadpool inside a 7-Eleven store with family and friends. We think Deadpool fans will love seeing him come to life in our stores." Shoppers can scan the app at checkout to earn loyalty program points and enter a contest for a chance to win prizes including movie tickets and a trip to Las Vegas. 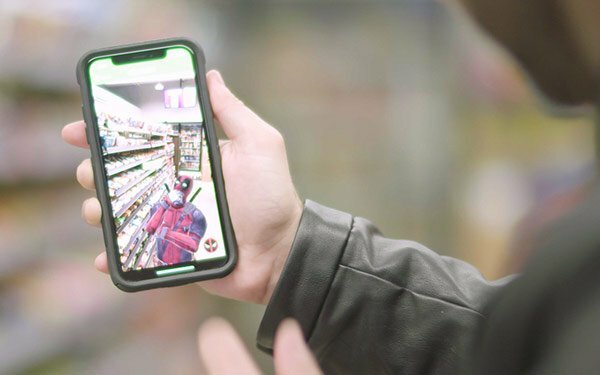 “Our collaboration includes exclusive products and an amazing in-store augmented reality experience that is among the first of its kind at any retailer," stated Sean Thompson, 7-Eleven senior vice president and chief customer officer.